In an 11,400-word document apparently written by Dorner, he said attacks against police officers and their families will stop when LAPD clears his name. Task Force Formed for Dorner Manhunt: "We Will Catch Him"
The Los Angeles Police Department is reopening the case surrounding fugitive Christopher Dorner's termination from the force, Cmdr. Andrew Smith announced Saturday during a news conference. LAPD Chief Charlie Beck "is not opening it because of the accusations or because of the musings of someone who is a multiple murderer now," Smith said. "He’s doing it because he wants to ensure that the public knows that the Los Angeles Police Department is fair and transparent." Smith said witnesses will be re-interviewed and the investigation into Dorner's firing will get a "fresh set of eyes." He also issued a plea for Dorner to come forward. "He can turn himself in and he can be able to get his side of the story out," Smith said. Dorner is accused of killing an LAPD captain's daughter, her fiancé, and a Riverside police officer in an alleged revenge-motivated shooting rampage. In a chilling manifesto, Dorner outlined plans to kill law enforcement officers and their families. He said the violence will end when LAPD clears his name. "The attacks will stop when the department states the truth about my innocence, PUBLICLY!!! I will not accept any type of currency/goods in exchange for the attacks to stop, nor do i want it. I want my name back, period," he wrote in the document published on his Facebook page. "There is no negotiation." Dorner used the manifesto to recount his firing and declare his innocence. He was fired from the LAPD in 2008, after reporting another officer for alleged brutality – an accusation that investigators later said was false. Smith repeatedly said the move to reopen the case was not to appease Dorner. Still, the tone of Saturday's announcement was starkly different from Beck's comments earlier this week in which he dismissed Dorner's manifesto as "the rantings of a killer." The alleged shooting spree, which began on Feb. 3 with the slayings of Monica Quan and Keith Lawrence, spurred the creation of a joint task force dedicated to the Dorner case, officials announced Saturday. The FBI, U.S. Marshals, and Irvine, Riverside and Los Angeles police departments comprise the newly created task force. 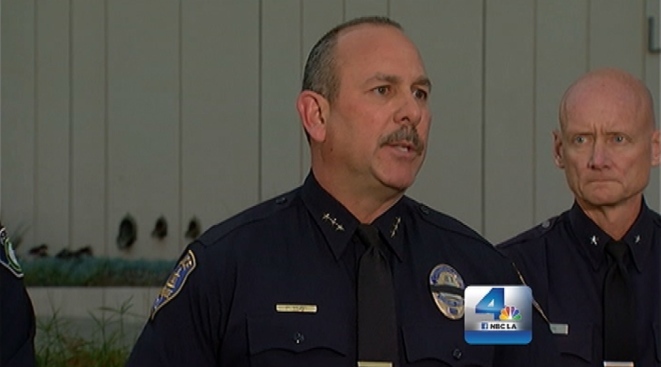 "This is an extraordinary, unprecedented effort," said Irvine Police Chief David Maggard. The search for Dorner turned to the Big Bear area Thursday and continued through the weekend after the discovery of the Dorner's burned-out Nissan Titan pickup in the woods south of Big Bear Lake. As the agency leading the mountain search, the San Bernardino County Sheriff's Department was noticeably absent when authorities announced the creation of the task force.